It took a long time to write this review simply because there was not allot about this book I liked. 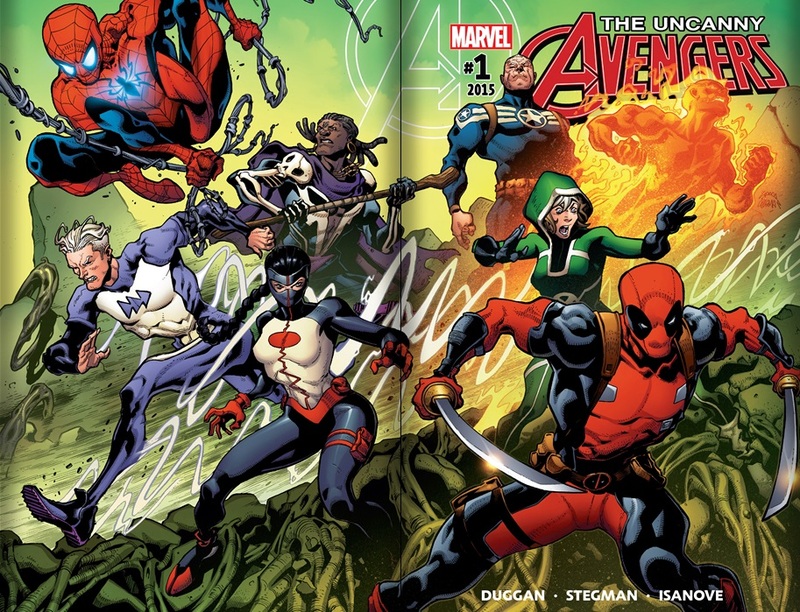 The Uncanny Avengers Brand and I are like oil and water we just don’t mix. This latest series finds Steve Rogers vouching for the increasingly annoying Deadpool. Ryan Stegman’s art was seen last time on the Inhumans series and it looked solid there. Here however his characters look emaciated and sickly. That is good for Rogue who is sick but for the healthy lot, not so much. Doctor Voodoo finds himself used as the token black member of the team. While other Avengers squads have seen increased black presence recently Uncanny Avengers has remained mostly Aryan. The team has an interesting dynamic with Rogue standing out because of the nostalgia I feel for her being a mutant and the fact that she’s the one member of the original “unity” squad still around. The Terrigen poisoning of mutants is also brought to the fore. What is curious however is why Rogue would remain on Earth exposed to the mists when they cause infertility and death to mutants and Storm is apparently making a mutant haven? Rogue is also the emotional centre of the team while the bromance of Torch and Spidey was touched on. Voodoo is used mostly as a medium to commune with the dead since his return (someone has clearly been watching too much Vampire diaries) it’s a nice way to make him distinct among marvel’s magic users but I find it rather bland. The team’s new base is also haunted and no doubt that will come up again as the series progresses. The villain meanwhile started out good on the first few pages but by the book’s end because a Doctor Doom wannabe with a warped environmentalist stance.